inspired by the glorious jewelry designs over at the glomourai, I decided to embark on a little DIY project of my own. while I am very well stocked on earrings and rings (I never leave the house without them), I do not have as many necklaces as I would wish. 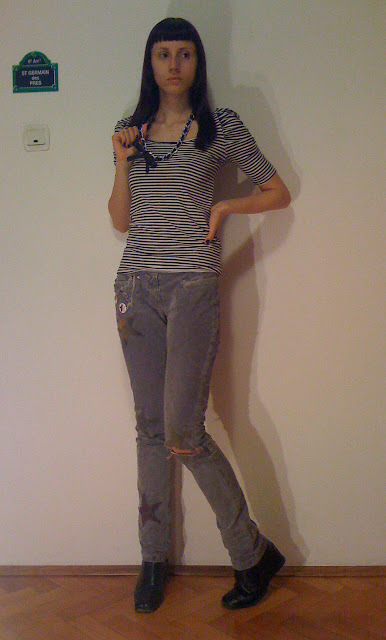 and so, I recently thrifted some necklaces and a chain belt. I only bought the belt with the intention of turning it into a necklace, as it was pretty horrible as a belt. what I did was I separated the chain from the rest of the belt, ran some black ribbon through it, tied a bow and ...voilà. nothing to it. what do you think? I knew I wanted the rest of the outfit to be a bit tough and edgy so I put on some ripped skinny jeans and a stripped shirt. can't wait to come up with other ways to wear this. So cute! I love creative minds. Your jeans are also sweet!